“This period in the life of the 1st Battalion was characterised by unexpected change. 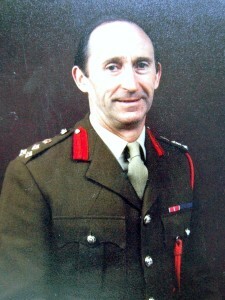 In Mons Barracks, Aldershot, in early 1975 the expectation was a short period in 16 Para Brigade, before a six-month tour with the UN Force in Cyprus. In the event, only Alma and Corunna Companies joined UNFICYP, under the command of 1 Royal Tank Regiment. The rest of the Battalion prepared to train with 16 Para Bde in Canada, but was ultimately sent to the Sovereign Base Area in Cyprus, working from first Episkopi and then Dhekelia, as part of the tail-end of Britain’s response to the Turkish invasion of Cyprus in 1974. During ‘Operation Mayflower’, following the Vienna Agreement, Alma and Corunna Companies helped the UN to monitor the historic and sad move to northern Cyprus of Turkish Cypriot families from their homes in the south. The Sovereign Base was peaceful; indeed our families, waiting patiently in Aldershot, were heard to say: “If he writes to me about one more beach barbecue, I’ll barbecue him when he gets back”. “A Return to Aldershot in late 1975 promised further training with 16 Para Bde, plus a spell on Spearhead standby and conversion to the mechanised role, before our expected move to join 11 Armd Bde in Minden, West Germany, in 1976. In the event training was interrupted, by the need to provide troops for ceremonial street-lining for the State Visit of President Nyerere of Tanzania and our sudden departure for Northern Ireland, four days before we were due to join the Spearhead Roster. Mechanised conversion training was resumed after our relatively uneventful two months in Northern Ireland, then interrupted by the need to provide a large party of officers and NCOs to help prepare a BAOR-based Gunner Regiment for a tour in Northern Ireland. We found our feet satisfactorily in Minden, although we discovered on arrival that the tactical doctrine of 1 Armd Div, which we had studied carefully in Aldershot, had changed and we had to bone up sharply on the new one! We won the Army Cup (and the inaugural Army Sevens) in 1975, but, sadly, failed to hang onto it in 1976.